This week Riccardo Tisci showed his Spring/Summer 2017 collection for Givenchy. For the better part of a decade Givenchy has maintained a spot in the upper echelon of the high-fashion luxury sector due to Tisci's creative vision and the marketability of his clothing. With his bold and envelope pushing designs, he redefined men's sports wear. He can even be credited with shifting the way men dress and their attitudes towards fashion. While he continues to thrive in the menswear market, the Spring/Summer women's collection has us wondering if the designer has already reached his summit. This season it seems as if Tisci is placating us with a few simple statements, and left us waiting for something more profound. He went through a series of consumer friendly stories within the collection that seemed more suited for appeasing buyers rather than fulfilling our Givenchy hope and dreams for next year. He said he wanted to do something "more powerful...tied to nature," in reference to the inspiration behind the collection. But I found the agate print fishnet slip dresses to be bold but removed from empowering. I suppose the idea of a women gaining strength from wearing such a bold piece could be the rationale, but I think the sentiment was lost in execution. 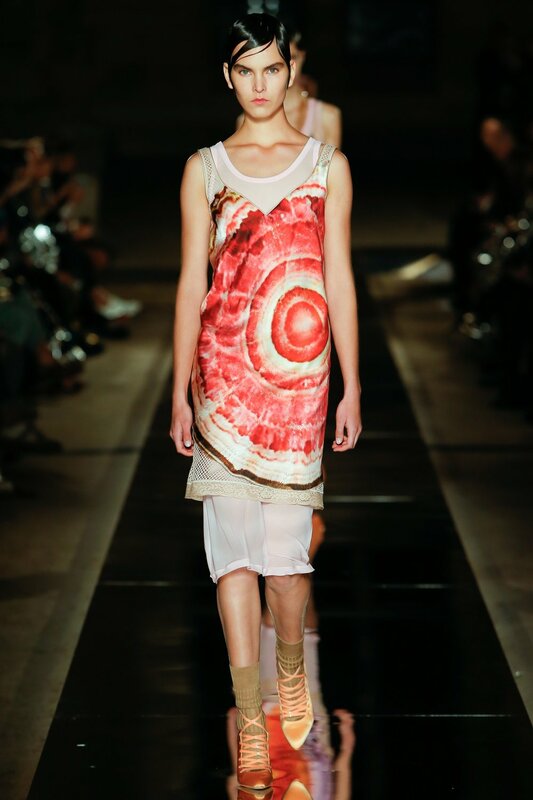 I am an avid fan of Riccardo Tisci but this wasn't the best representation of the scope of his creative abilities. Next came a series of suiting and outerwear with outward sewn zipper lined pockets that mimicked the men's SS17 collection and satin cocktail dresses. 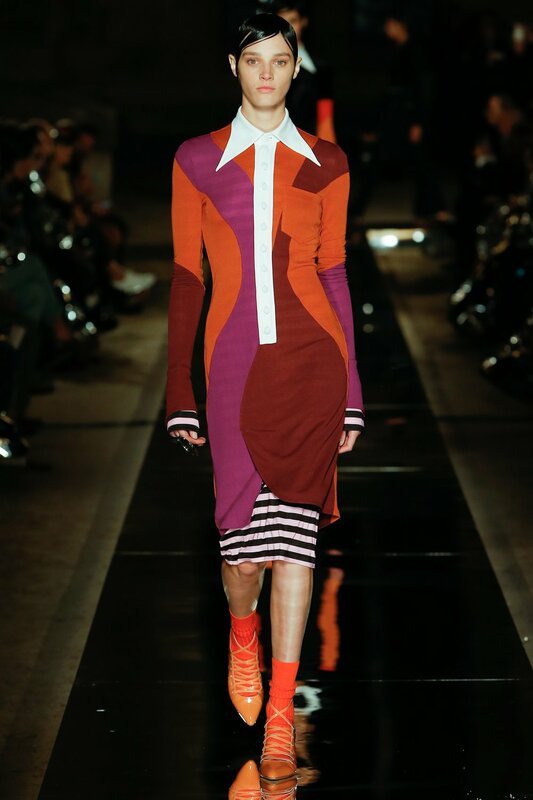 Where I feel Tisci made the most impact this season is the seventies inspired school boy shirt dresses. 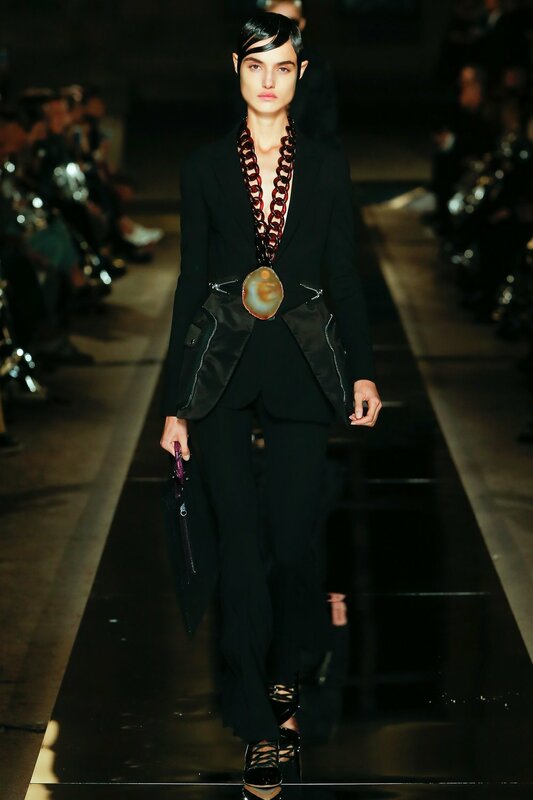 With muted earth tones and exaggerated collars Tisci turned out psychedelic and wallpaper inspired pieces that were colorful and will keep fashionistas impeccably dressed on their Saturday lunch dates. This might not have been Riccardo's strongest effort for the the French fashion house but we haven't lost our faith. Photos by Monica Feudi courtesy of Vogue.